One of the main considerations back in 2005 when we first occupied our flagship Padiham premises, was the installation of a first class, modern and efficient racking system. To the casual observer, racking appears to be quite a simple construction. To people within the logistics industry, it is far more than that. What industry provider should we engage? How many racking locations can be created? How high should each location be? Can we accommodate standard pallets, euro pallets or a combination of? How much remaining floor space do we require to enable the stock to flow efficiently? What aisle widths should be afforded? What kind of lifting equipment is most suitable for the job in hand? What health & safety considerations need to be addressed? 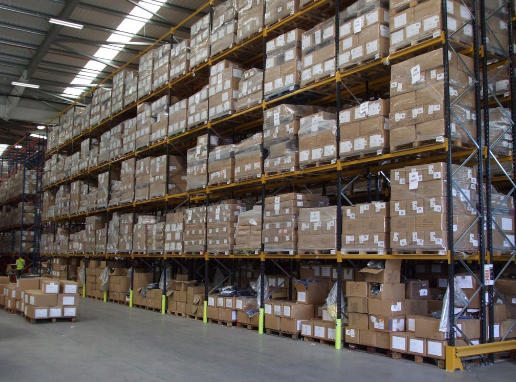 Is our warehouse floor up to category 1 standard? Having sought and listened to advice from several local blue chip companies we made the decision to work alongside market leaders Link 51 and Toyota Material Handling UK. We decided on a 75%/25% split between standard pallet locations and euro pallet locations constructed in a VNA (Very Narrow Aisle) format. This enabled us to maximise our storage capacity and allowed us the ability to move large volumes of palletised stock on a daily basis. To comply with operating in a VNA format, we installed a wire guidance system that ensured that the man-up fork lift truck located on the system and therefore eliminating racking collision through human error. Our comprehensive racking system is fully maintained by a sub-contractor who is fully compliant in SEMA (Storage & Equipment Manufacturers Association) codes of practice. In addition to this we have a thorough and robust reporting system and a weekly check for racking damage. As can be seen, there are so many things to think about and consider but by talking and more importantly listening to people that have been in your position before is the best advice to take on board. They are the people who have made the mistakes before, so that you don’t have to.